"For outstanding contributions and leadership in the fields of hydrological modelling, water resources assessment and capacity development in sub-Saharan Africa"
Prof. Hughes has made outstanding contributions to promoting the science and practice of hydrology in the sub-Saharan Africa region, as well as having an excellent international reputation through his contributions to the fields of hydrological modelling, environmental flow requirements and uncertainty quantification in the assessment of water resources availability. · The development of uncertainty approaches to hydrological modelling and the promotion of the concepts of uncertainty in both scientific hydrology and water resources practice. · The development of a range of methods to support the determination of environmental flow requirements, some of which have been applied in many different parts of the world. · The promotion of improved cooperation between hydrology research institutions within the southern Africa region and encouraging its young scientists to contribute to the international research community. · The supervision, training and mentoring of a large number of young African scientists, leading to an increase in the number of PhD graduates in the region. 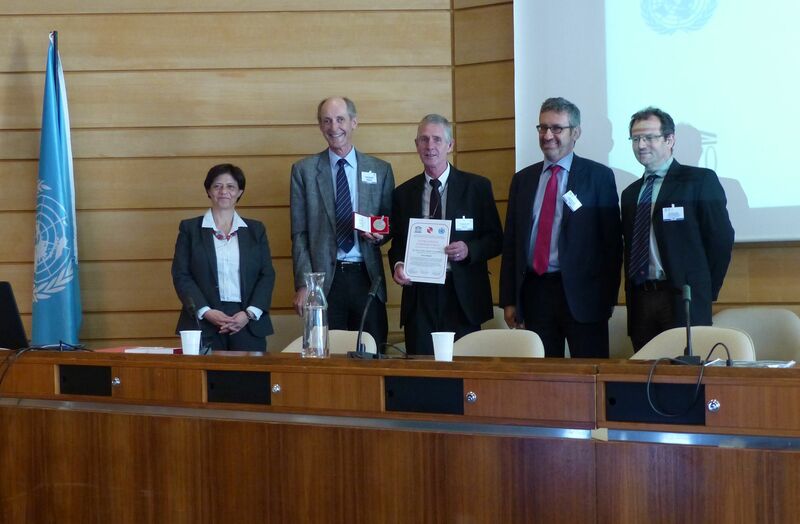 · Participation in IAHS, WMO and UNESCO activities, including service as an officer of IAHS and participation in a number of WMO and UNESCO projects. · Supporting scientific endeavour in southern Africa through his editorship of the Journal of Hydrology: Regional Studies, guest editorship of a special issue of the Hydrological Sciences Journal on sub-Saharan hydrological studies. Prof Hughes obtained his PhD degree from the University College of Wales in 1978. He moved to the Hydrological Research Unit (HRU) at Rhodes University in South Africa in 1980 and has remained at Rhodes ever since. He was instrumental in forming the Institute for Water Research (IWR) in 1991, a multi-disciplinary research institute focusing on hydrology, freshwater ecology and environmental water quality. Prof Hughes was an active member of the UNESCO Southern Africa FRIEND project and was a local organiser of the 2002 International FRIEND conference held in Cape Town. He was part of the review committee for the sixth edition of the WMO Guide to Hydrological Practices that was published in 2008 and he also contributed to the third UN World Water Development Report of 2009. Prof Hughes has always placed a strong emphasis on the development of post-graduate students. His research programme graduated 15 PhD’s and 12 MSc’s from different parts of sub-Saharan Africa, including the Democratic Republic of the Congo, Lesotho, Mozambique, South Africa, Swaziland, Tanzania and Zimbabwe. These contributions are significant in a region where there are relatively few research hydrologists available to provide supervision support for post-graduate research studies. Prof Hughes strongly promoted his perspective on practical hydrological modelling within the IAHS PUB decade, as well as during the planning for the Panta Rhei decade. During the mid-1990s South Africa began to introduce new water legislation that included the so-called ‘Ecological Reserve’ - the local terminology for a proportion of the natural flow regime of rivers that should be preserved to ensure environmental sustainability of water resources. Prof Hughes was a pioneer in developing relatively simple desktop approaches to determine the ecological reserve, designed for rapid assessments in data scarce situations. This excellent work is a clear illustration of the importance that Prof Hughes has always placed on the parallel developments of research and practical implementation of hydrological and water resources science. Water Resources Science field of practice. He has also served on the South African Committee of the International Hydrological Programme (IHP) of UNESCO. "For outstanding contributions and leadership in the fields of hydrological modeling, water resources assessment and capacity development in sub-Saharan Africa". 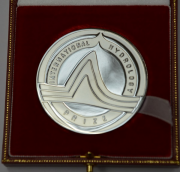 I am, of course, extremely honoured to be awarded this medal and I would like to thank IAHS, UNESCO and WMO for recognizing my contributions to the science of hydrology and water resources. I would also like to thank my colleagues from South Africa who initiated the nomination, particularly Graham Jewitt and a former student Evison Kapangaziwiri, as well as other colleagues who supported it. Given the high degree of career mobility that is apparent amongst younger research scientists these days, it is somewhat embarrassing to admit that I have only had two jobs in a 40 year career, and the first one only lasted for 3 years. Other researchers often measure the ‘tipping points’ in their careers through changes in jobs. While I obviously can’t do that, I have identified some key points in my career that have seemed like changes in job profile, even though the geographic location of the job did not change. The first tipping point came when I was accepted to do a PhD with John Lewin at Aberystwyth University on the topic of floodplain inundation dynamics. John taught me a great deal about conceptual thinking in geomorphology and hydrology and also was good enough to employ me as a research assistant after I had finished most of my PhD. Unfortunately, the UK economic climate at the end of the 1970s meant that finding another research post was very difficult. That led to a quite major tipping point in 1980 – a move to Rhodes University in South Africa to join the Hydrological Research Unit for a 5 year contract on hydrological modelling research. I knew very little about hydrological modelling and even less about the semi-arid environments in which we were conducting some of the research. It was also a difficult move from a social and political perspective, given the turmoil that marked this period in the history of South Africa. Fortunately, I was working alongside Andre Gorgens who knew quite a lot about both the science issues as well as the political issues. Andre was an ideal follow–on to John Lewin and he mentored me through my few years foray into the field of coupling hydrological process understanding and modelling, particularly in semi-arid catchments. The next tipping point was not related to science, but was the dominant reason why I stayed in South Africa and am still their today. In 1983 I met my wife Ros who was close to finishing her PhD in Pharmacy. We were married in 1987 and by 1989 had two boys and an established family life in the small city of Grahamstown. So much for the initial idea of a 5-year contract and then back to the more familiar social and political life of the UK. In fact, Ros, who has been at Rhodes University as a student and staff member for longer than me, also had no real intentions of staying in Grahamstown after her PhD, so this was a major tipping point for her as well. In 1991 we hydrologists merged with the Institute for Freshwater Studies to become the Institute for Water Research. This led to future research and consultancy projects in the fast emerging field of environmental flow assessments, coupling hydrology with ecology. This was quite an exciting research theme as we were developing new approaches and applying them in practice at the same time. Playing referee between ecologists and water engineers was also quite interesting. One major tipping point came at more-or-less the same time that the long overdue political reforms in South Africa started. In 1994 the South Africa Water Research Commission funded my involvement in the UNESCO FRIEND project. This came at a time when the local funding agencies were reluctant to continue funding field-based hydrology and ‘theoretical’ hydrological model development. In contrast, they were very keen to demonstrate support for collaboration with other southern African institutions. The FRIEND project involved collaboration with many other individuals and groups in Africa, including universities and staff from several national hydrometric agencies. I started to get a real feel for some of the problems that exist in doing hydrological science and practical water resources assessment and management in Africa. The southern Africa FRIEND project allowed me to establish ties with CEH in Wallingford, and other groups such as IRD in France, who were major drivers of the international FRIEND programme. I would like to acknowledge the support of people such as Alan Gustard, Andy Bullock, Simon Mkhandi, Felix Mtalo and Eric Servat who contributed to the success of the early stages of the southern Africa FRIEND project. The FRIEND project was also instrumental in facilitating closer involvement with IAHS. For the first 25 years of my time at Rhodes University I was a contract staff member and had to generate my salary and research costs from external research and consultancy contracts. In 2005, the University started to pay my salary and that meant that I could divert more time and much of the external income to funding post-graduate students. It was also a time when we recognized the need to introduce some of the international uncertainty modelling concepts into the way in which we do water resources assessments in the data scarce regions of southern Africa. We started slowly with two post-grads and enlisted the support of Thorsten Wagener to help us through the early stages of grappling with uncertainty and incorporating it into our own modelling research. I am very grateful to Thorsten for his contributions to our understanding and some of the ideas behind the research projects of post-grads who joined us in later years. The next tipping point came at the end of 2008 when we were awarded a 3 year funding stream to initiate the sub-Saharan Africa Water Resources Network as part of the Regional Initiative for Science Education programme funded by the Carnegie Foundation of New York. This project was designed to promote post-graduate education and we have enjoyed two further 3-year periods of funding, allowing our network to support 21 PhD and 16 MSc students, many of whom have already graduated. The RISE programme brought students to Rhodes University from different cultures and countries of sub-Saharan Africa, many who would otherwise not have had an opportunity to get started on research careers. They worked, or are working on, many different projects, typically large scale and regional – including climate variability and food security in the Zambezi basin, hydrological modelling of the Congo River and the whole of Swaziland and modelling the floodplain and wetland inundation dynamics of large rivers. This has been a very rewarding period in my career, particularly watching young people, from generally disadvantaged academic backgrounds, develop their science and research skills. The final tipping point comes at the end of this year when I formerly retire and assume an emeritus position in the University with several outstanding projects to complete and several remaining post-graduate students to supervise. I have noted with interest how my wife, Ros, has handled her early ‘retirement’ from teaching duties due to health problems. The most obvious thing is the renewed energy and enthusiasm that she applies to her recent focus on nurturing post-graduates and collaborating with a range of people on health literacy issues. I can, perhaps hope that my level of enthusiasm for my own research work after retirement will reach the same levels as hers. I would like to say a global thank you to the many colleagues, from many different countries, whose research has provided me with inspiration and ideas for my own work in African hydrology and water resources science. Finally, I am very grateful to Ros and our two sons, Gareth and Evan, for making family life at least as rewarding as my working life and for making it relatively easy for me to combine the two fairly seamlessly.